The Cesar Chavez Student Center’s Art Gallery held a reception for “Black Power, Flower Power” Thursday, Jan. 6. The exhibit held Black Panther Party and Haight-Asbury photo collections from the 1960s. All 200 photos displayed at the exhibit are the original copies taken by husband and wife, artists Pirkle Jones and Ruth-Marion Baruch. The reception kicked off at noon with a film screening titled “Slavery by Another Name,” followed by an interactive art project, “What’s Your Cause?” which started at 5 p.m.
During this art project, attendees were encouraged to design buttons to express their passion and honor for the civil rights movement. “It’s nice to have people show what their campaigning for. I’m really excited for this event,” said Ines Diot, the art gallery assistant who was also running the art project. 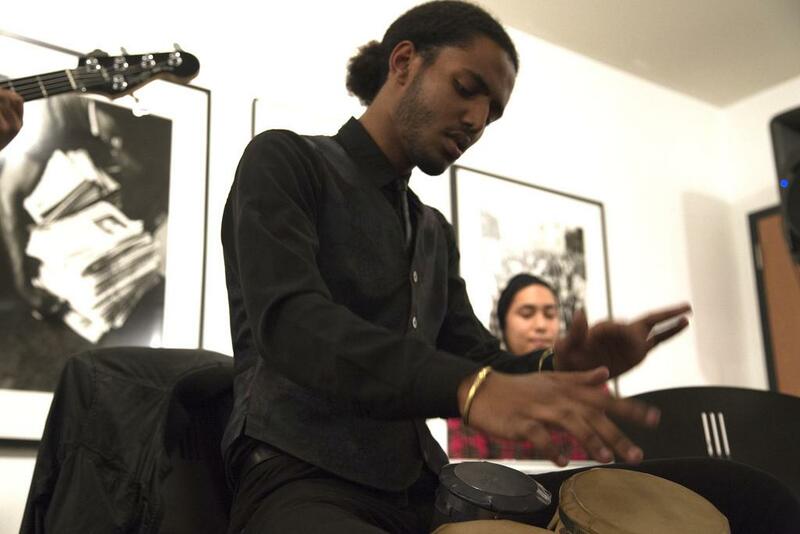 “The Pull,” a band composed of SF State students, filled the art gallery with live music. “I think it’s a massive honor to perform at an event during Black History Month,” said the emcee, Cristian “Verbalistic” McArdle-Hankin. Accompanying the music was about 50 people. A wide variety of complimentary food and drinks were served including coffee, wine, macaroni and cheese and chicken wings. After a few more live artists performed, about 30 people gathered for an open discussion in the Richard Oakes Multicultural Center. Elaine Brown, a former Black Panther Party Chairman, held the discussion. Brown responded to the film screening that took place earlier in the day and shared personal experiences with the Black Panther Movement.